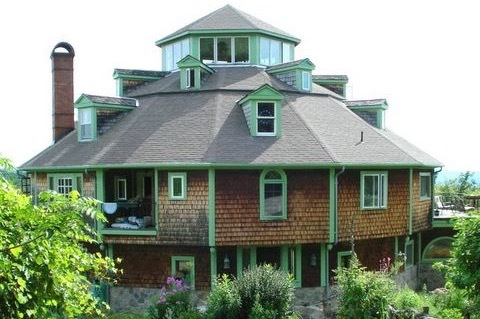 The Roundhouse is indeed almost a round building...fourteen sided...four storied with a cupola on top. It was designed to bring people together in community while providing folks privacy when needed for re-creation or sleep. It has thirty individual beds, (& 1/2 are doubles) some are in curtained cubbies, some are in bedrooms. It was also designed to stimulate your imagination, your creativity, your sensual, artistic nature. There is a gorgeous dance arena, (where many weddings have been held) & more musical instruments than you would have imagined (including 2 baby grands); its acoustics are so good that recordings have been made here. There are the things available to enhance your every artistic impulse: easels, costumes, a hat collection to die for, unicycles, juggling clubs: name it! There is also an amazing electronic sound system — a 9 x 12 movie screen and a library of films bigger than that at most colleges. The kitchen is a living, workable cozy room with pantry and with great views. It has two double sinks, 2 ovens, 2 frigs, a six burner stove top and just about every kitchen gadget you could imagine. Rebekka, a storyteller artist, herself, who created the house from a dream, and a gift of the monies from one who admired storytelling, is also a great cook. She will cook for you with foods that your palates and tummies appreciate using as much locally sourced and organic foods as seasons permit. Folks who are here get a turn to help out in the kitchen, setting or cleaning up after meals and before leaving…We nourish community. Some Groups have even chosen to do all their own cooking; in which cases, Rebekka has moved to the Cottage on site with her two most loving dogs, though available for help or instruction. 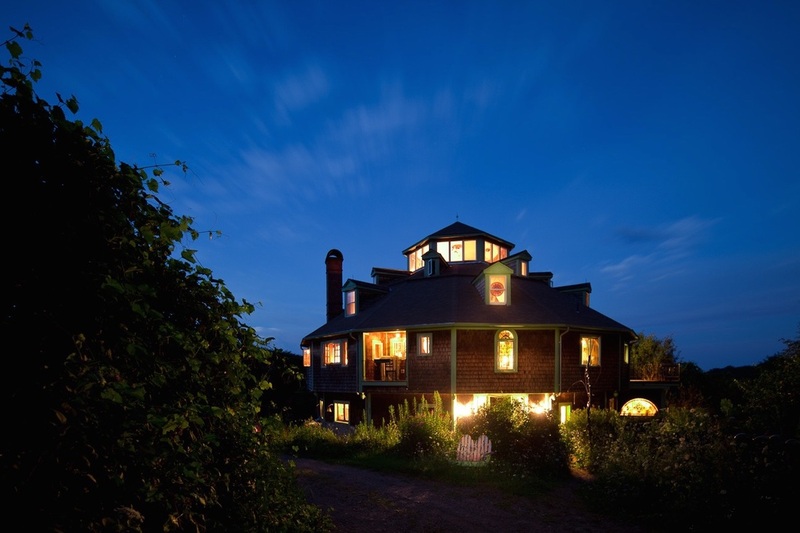 The main house looks over two river valleys, the rising sun and moon. It is located but five miles from Greenfield on a dirt country road, grand for quiet walks and the town is great about winter plowing. Trails abound too through the woods. CSA farms and stand are nearby. Wild and horticulture plants are on site, including many fruit trees and there are wild and domesticated animals: it a bunny haven, beloved by moose, and the barn houses darling donkeys and doggies are about.